Name, age, hometown: Sarah Bunkley, 21 years old, Fort Myers, Fla., U.S. What corps are you in and what is your role this summer? Kiwanis Kavaliers, pit member and ageout. Give us your full drum corps/marching music background. In high school, I did four years of marching band, four years of indoor percussion, and this will be my fifth year with the Kavaliers. What's your practice schedule like? I don't have an instrument at home, but I teach at a local school. So, I practice when they practice. What does your ideal free day consist of? Being able to stay in one place and relax. Not having to walk around is optimal. Favorite pig-out food: Chicken-in-a-biscuit and Cheez Whiz. In the shower you can hear me singing: Nothing. It's scary when I sing. The last good book I read: I haven't had much time to finish books, but the last good book I started to read was "Broken Summers" by Henry Rollins. The last great film I saw: "Crash" Jobs I have/have had: Loading the truck, always loading the truck. And bus captain. My favorite TV show: "M*A*S*H*"
What has been your formative drum corps moment? For me, it's not so much one moment as a series of moments and memories that make me who I am today. The different people I've marched with and remains friends with to this day is really what makes the drum corps activity what it is to me. What would you be doing next summer if you were not marching? Probably helping the corps -- selling souvies, baking something. How did you decide to be a member of your corps? I originally auditioned for Tampa Bay Thunder, a Division II corps. Later that winter, Kiwanis and Thunder came together, and they invited anyone who was offered a spot the opportunity to march in a Division I corps. 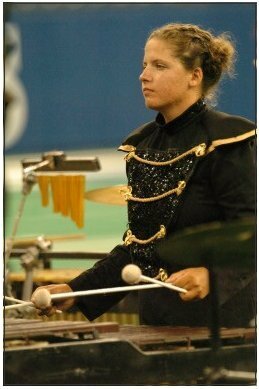 What first attracted you to the drum corps activity? Members of my drum line in high school were always talking about drum corps. We watched the videos, went to the shows, and after two of the guys went and marched, and told us all about their summer, I decided it was something I really wanted to do. What advice would you give to young people who want to march? The sooner the better. Favorite drum corps personality and why: DCI contest coordinator Tony DiCarlo. You'd have to be a pit member to understand. Best drum corps show ever and why: I don't know about "best," but my favorite is Santa Clara Vanguard 1995, "Not the Nutcracker." I can't really explain why.